"Wouldnt be able to share too much about her" but she is beside him in the photo? This type he go Vietnam throw stone in the street can 50:50 hit one that is better looking .... why go KTV to find? 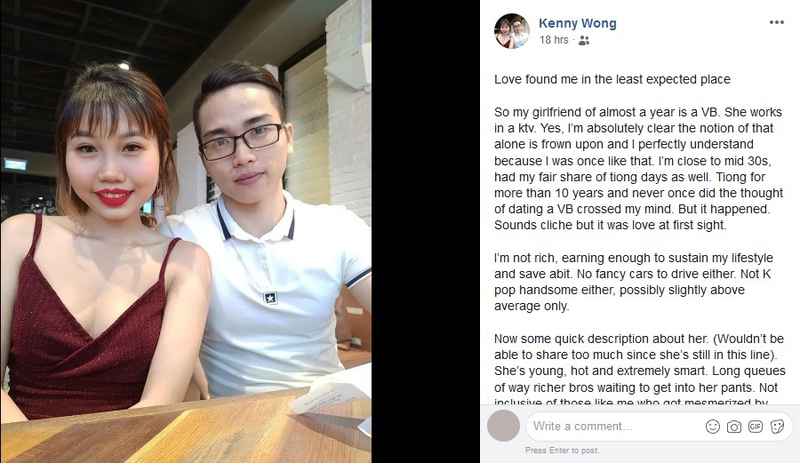 He simply likes the idea that there are long lines of "richer" bros queuing up for his hot commodity while he is the "winner" that won her heart. Perverse somewhat but maybe it floats his boat. Actually I don't understand y they do their trades, is it because it is easy or is it because it is lucrative. Don't uds, the guy doesn't look bad, how come need to go prostitute. Go club / bar don't hv? And got so many woman but marry prostitute. And if only $50, he not scared... so many ppl can afford $50.